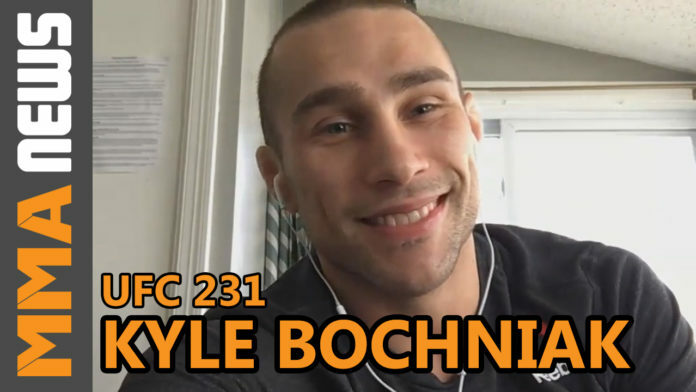 It’s rare to lose a fight and gain notoriety but that’s what happened to UFC featherweight Kyle Bochniak at UFC 223. Despite losing to Zabit Magomedsharipov by unanimous decision in April, Bochniak’s heart and determination in that slugfest earned him the respect of his opponent and MMA fans everywhere. It’s that perseverance which he believes will lead him to victory this Saturday when he faces Hakeem Dawodu at UFC 231. Bochniak (8-3) has yet to find consistency in his UFC career, alternating between wins and losses in his last five fights. Looking to break the cycle, “Crash” trained at Tristar Gym ahead of this matchup thanks to the help of former UFC middleweight and fellow CES MMA alumni Eric Spicely. Dawodu (8-1-1) is coming off his first UFC victory back in July as he defeated Austin Arnett by unanimous decision at UFC on FOX 30. The 27-year-old Champions Creed product will be looking for back-to-back wins for the first time since Mar. 2017 in his second straight fight in Canada. UFC 231 takes place Saturday (Dec. 8) at Scotiabank Arena in Toronto, Ontario. The main event features featherweight champion Max Holloway defending his title against undefeated Brian Ortega.